When Life Gives You Hailstorms, Make . . . a Big Bowl of Hail? “Hail! Hail!” I screamed, and we all made a mad dash. Not indoors, no, but to the garage to get boots, umbrellas and (my kids’ brilliant idea) protective headgear. Because how often does it hail? Maybe once a year, if we’re lucky. It’s quite the event. 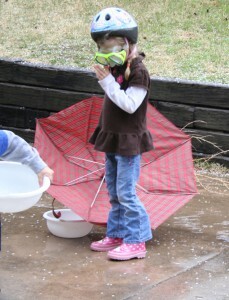 And what do you need for hail gathering but a snorkel mask, bike helmet, and a really big bowl. My sweet little ducky baby. He was very serious. He needed a spoon. 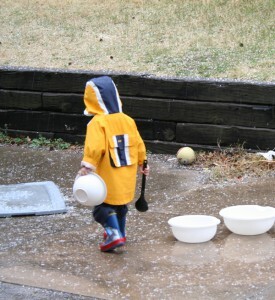 “What are you going to do with all that hail?” I asked my seven-year-old. 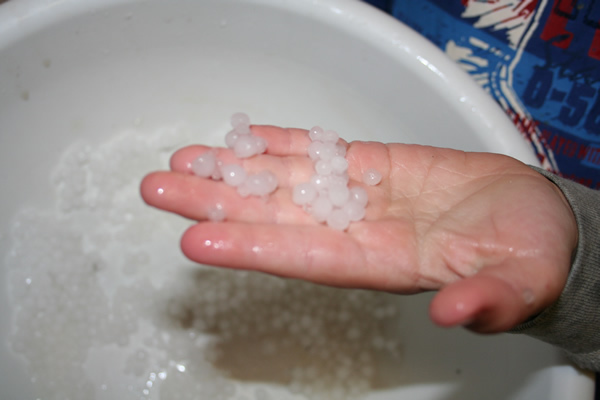 I thought this would be a great science lesson, but I can’t find hail in any of our science books! Here’s a pretty good diagram though. http://scijinks.nasa.gov/_media/en/site/rain/hail-formation-large.jpg I’m hoping to have them color it at rest time, and I’ll explain it at dinner. We’ll see if that gets done. Have a lovely day friends! Hope you’re enjoying the weather wherever you are, hailstorms or not!